There is a new popular phenomenon in China called “internet poets”. One of the most red poets is Yu Xia Hua from the Hubei province. She was born in 1976 in the little village Hen Dian where she has lived all her life. As her birth was complicated and she was deprived of oxygen she was born with CP damage. She started to publish poetry on the internet at the age of 22 and her first collection of poems was edited in 2014. The book called” Yue guang luo zai zuo shou shang” “The moon shines on my left hand”. To translate Chinese into a western language is always a challenge and when it comes to poetry the translation is more a question of interpretation where it is essential to transfer different moods and emotions. In her very emotional poetry she writes about the ordinary and about her everyday life with a dimension of melancholy and with a reflection upon the strangeness of life. For our project we have chosen 5 different poems from the collection “The moon shines on my left hand”. 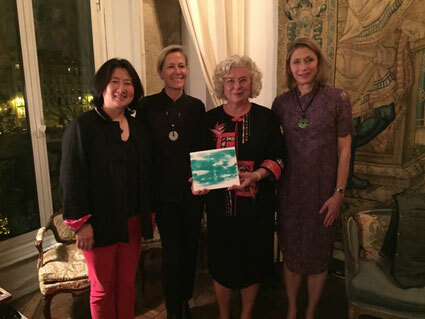 Birgitta Lindqvist who speaks Chinese since she lived in China during the Cultural Revolution has translated the poems into Swedish assisted by Lili Weil, Chinese teacher in Paris. Together with Elin Lindqvist she has translated the poems into English and French. Lili Weil is also a calligrapher and with her delicate brushstrokes she has made the Chinese hand written version of the poems. 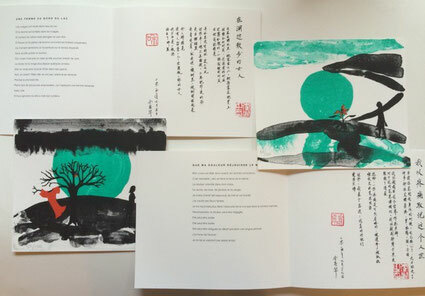 Those calligraphies have been scanned and placed next to the translations of the poems on the opposite page. 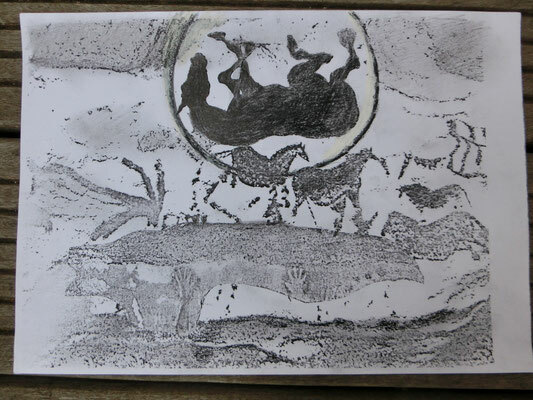 The visual artist Gabriella Gala Legillon illustrated the poems with 5 original lithographs. They were printed at Atelier “A Fleur de Pierre” in Paris. Gala who grew up in Sweden came to France 1980 and entered the State School for Decorative Arts (Ecole Nationale Supérieure des Art Décoratifs ) in Paris where she studied Stage Design and Painting. She then lived and worked in South Korea, in Italy and in Ireland. In 2008 she was an “Artist in residence” in Shanghai and exhibited at the Hong Merchant Gallery. The book design and the typesetting are made by Annika Baudry, Graphic Designer and Bookbinder in Paris. She graduated from the Parsons school in New York but is now based in Paris. 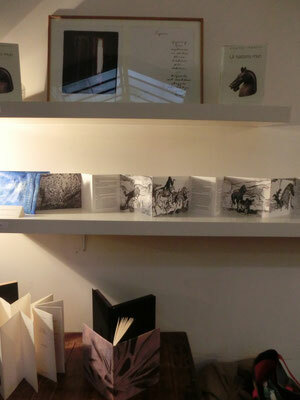 The book is printed on BFK Rives paper at Atelier “A Fleur de Pierre” in Paris. It is printed in 3 languages; 25 in Swedish, 25 in French and 50 in English. They all include the Chinese calligraphy. All together there are 100 books who are numbered 1 – 100. All the lithographs are signed by the artist and the calligraphies are stamped with the calligrapher’s original seal. The price of the book is 300 €. These litographs were created by GALA thanks to the Forssius Stiftelse Grant from 2015.